Noted For: Betty Boop, Koko the Clown, Popeye animation, Superman animation, Gulliver’s Travels, and more. … taking shape in 1915, when its mechanically-minded founder got an idea for a process whereby live-action footage could be transformed into animation. His device — the rotoscope — is still in use. But the animation studio he founded is long gone. Fleischer was art editor of Popular Science Monthly in 1915, when he had the idea for the rotoscope. He and his brother Joe, also good with machines, built the device, and their brother Dave played the clown (later named Koko) in the live footage that they transformed into their first cartoon. On the basis of a one-minute sample reel, in 1919 they made a deal with John R. Bray, one of animation’s pioneers, who then had an exclusive contract to supply cartoons to Paramount Pictures. They would produce one cartoon per month for Bray, to appear as part of Bray’s Paramount Pictograph screen magazine. Fleischer’s “Out of the Inkwell” series (relatively little of which actually wound up being rotoscoped) quickly rose to prominence among the Bray offerings. When, in 1921, Max and Dave Fleischer formed a partnership to produce animated films on their own (with Max as producer and Dave as director), the Bray studio lost its brightest light. This came in conjunction with another Fleischer innovation — the bouncing ball that helped lead audiences in sing-alongs. The Fleischer Studio teamed with Dr. Lee DeForest, an early sound experimenter, to produce sing-along cartoons with sound as early as 1924. But the DeForest process didn’t catch on. It wasn’t until 1928, and The Jazz Singer, that technology existed for truly effective talkies. When the true sound revolution did come, the Fleischer Studio was one of the few animation producers to survive the transition. 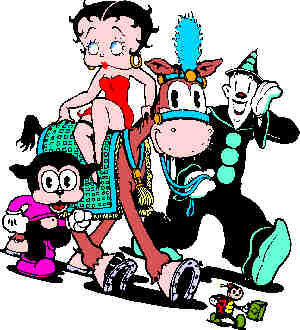 In fact, it was in one of their first few “Talkartoons” (as they called their early post-Mickey sound cartoons) that they introduced their biggest star — Betty Boop. They followed it a few years later by licensing Popeye the Sailor from King Features Syndicate. Popeye proved as big a hit on the screen as he’d been in newspapers, and Paramount, which distributed the Fleischer cartoons, was able to hold its own in an animation climate that was increasingly dominated by Disney. Another Fleischer invention, the Three-Dimensional Setback (a tiny stage with animation cels hung in front, creating a startlingly three-dimensional effect) was every bit as effective as Disney’s multi-plane camera. A later licensed character, Superman, showed they were able to compete on the basis of lavish production values, as well. They only received five Oscar nominations — Sinbad the Sailor (1936), Educated Fish (1937), Hunky & Spunky (1938), Riding the Rails (1938) and the first Superman cartoon (1941) — but that was a period when practically nobody was getting Oscar nominations except Disney. In a sense, however, it was Disney that proved the Fleischer Studio’s undoing. In the wake of Snow White, it became clear that the real way to win prestige in animation was to produce a feature. Fleischer was the only studio of the time to take up the challenge. They did two — Gulliver’s Travels (1939) and Mr. Bug Goes to Town (1941 — later re-released as Hoppity Goes to Town). Artistically, they succeeded in many ways, but they failed to make back the money Paramount advanced for their production. In 1942, Paramount foreclosed on the loan, took over the studio, and fired the Fleischer Brothers. In many ways, things continued as before. The studio, renamed Famous Studios, continued to turn out cartoons as Paramount’s in-house animation unit. Some of them, in fact, were pretty good. But the true innovators were gone, and with them, the studio’s spark of excellence. Despite the fact that Disney’s lock on the Oscars was broken in the early 1940s, no Famous Studios cartoon was ever so much as nominated for one. Today in Toons: Every day’s an anniversary!